Windows XP support is ending. What do I do now? Microsoft's support for Windows XP SP3 and Office 2003 is ending April 8, 2014. Have you upgraded to Windows 7 or newer? Thus, Windows XP SP3 and Office 2003 will go out of support on April 8, 2014. If your organization has not started the migration to a modern desktop, you are running late. Based on historical customer deployment data, the average deployment can take 18 to 32 months from business case through full deployment. To ensure you remain on supported versions of Windows and Office, you should begin your planning and application testing immediately to ensure you deploy before end of support. Windows XP will still continue to work (and your programs too) but you will no longer receive any security updates or operating system patches from Microsoft, including if you contact Microsoft Support. After April 8, 2014, there will be no new security updates, non-security hotfixes, free or paid assisted support options or online technical content updates. Now is a great time to get started! It's not too late to get started planning your company's Windows upgrade! There are many options for small and medium businesses considering moving to a modern PC with the latest productivity and collaboration tools. Small to mid-size organizations should locate a Microsoft Partner (like Arrow Technology Solutions) to understand the best options to meet their business needs. If your current PC meets the system requirements for Windows 7 or Windows 8, you can buy Windows 7 Professional or Windows 8 Pro from a local retailer. 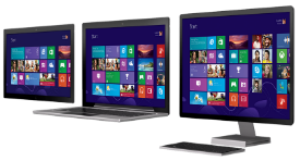 If your PC does not meet system requirements, consider purchasing a new business PC with Windows 8 Pro. How can I get help with my upgrade? Our team can help you develop an upgrade plan that will not only prepare you for Windows 7 or later, but it will also help you with planning future technology upgrades. Office 365: Why move to the cloud? Office 2013: Productivity made easy. Windows 8, the latest desktop operating system from Microsoft, is now available! It's the most reliable version of Windows to date, plus it's packed with many time-saving features and capabilities! Experience Windows in a whole new way through new devices that are thinner, lighter and more innovative. Not ready for Windows 8? if you purchase your Windows 8 upgrade through Microsoft's Open Value licensing program, you're entitled to run any version of Windows with your Windows 8 license! This means, that you can upgrade from Windows XP to Windows 7 now, then upgrade to Windows 8 when you're ready.